My son and I spent most of the weekend--the last weekend before school starts up again--watching movies and reading books. I read a couple good books, including Joe Abercrombie's Best Served Cold along with a bunch of non-fiction research stuff for my next book. We watched Pan's Labyrinth, V for Vendetta, and all three Jason Bourne movies (Identity, Supremacy, Ultimatum). I had somehow missed it the last time I watched The Bourne Identity, but I've stood right where the final scene takes place, a taverna just below the famous windmills, which in the movie had been turned into a scooter rental business run by Marie. We got a thumbs up from our resident Miyazaki expert, my son Christopher. Overall, Ponyo's fun, crazy, funny, sweet, touching. Fantastic and creative animation, as usual from Studio Ghibli. Love the look of the ocean, especially from below the surface. Brilliant stuff. First, Sosuke's mother, Lisa--voiced in the American version by Tina Fey--is hands down, absolutely, without any doubt, the best mom in any animated film--and she drives like a maniac, a plus in my book. There are always special things in every Miyazaki film that stand out for me, and one I noticed in Ponyo is so simple, but it's a detail you miss in other animated films. It's difficult to put my finger on why this struck as wonderful, but there's a scene with Lisa and Sosuke returning home, and she stops, puts down the grocery bags, gets out her keys, unlocks the door, opens the door, kicks it to keep it open for Sosuke, all in one brilliantly smooth stream of action. This sounds mundane, but I'm telling you, there's magic in that. "Of course I speak whale"
This week's Illustration Friday topic is "flawed" which I'm taking as unsuitable and improper rather than defective--although not going to pretend this one's not. I was doing some underwater sketching with Kassandra, getting ready for a new set of panels for Saltwater Witch this weekend, and...Dory just sort of swam into the scene and started asking questions. Dory, if you don't already know, is the coolest character from the movie, Finding Nemo (played by the wonderful Ellen DeGeneres). What's hanging off your cellphone for the Twilight premier? 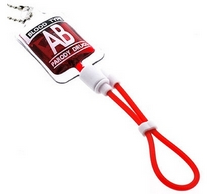 Saw this on Popgadget, blood drip cell phone straps, in major blood types. Crazy. I dug up our DVD of My Neighbor Totoro and the plan is to watch it tonight. (If you don't know this one, you've probably heard of some of Hayao Miyazaki's other great animated films: Spirited Away, Castle in the Sky, Nausicaä of the Valley of the Wind, Howl's Moving Castle, Kiki's Delivery Service, Princess Mononoke). Christopher and I drew some of our favorite characters from the movie. (Some of Con's as well, I happen to know). These are Soot Sprites, basically animated dust bunnies with eyes who inhabit abandoned houses. Here's the wikipedia entry on "susuwatari"--traveling soot. See also, http://www.nausicaa.net/miyazaki/totoro/ and the Totoro trailer on YouTube. Alice and the kids and I went to see Christina Ricci in Penelope tonight. Very fun, guys leaping out of windows, witches, pig-nose curses, and all played in a sweet fast paced cool-kitsch style with Penelope narrating parts, trying desperately to throw off the curse. Wonderful. Go see it! Stand in the Fire - a live album (recorded in 1981) by Warren Zevon [remastered and recently re-released] featuring (what else) "Werewolves of London"
Juno Books (http://www.juno-books.com) is celebrating Halloween and the release of DANCING WITH WEREWOLVES by Carole Nelson Douglas (http://juno-books.com/dancing_with_werewolves.html) with a quiz. All you need to do is provide the name of the book or story and the author of the ten werewolvian literary excerpts (see link above) and email the answers to info@juno-books.com with the subject WEREWOLF CONTEST. Deadline is October 10. Winners will be announced on Halloween.